Finalmente il campionato Slovenya omologato. Ringrazio tutti i giudici di aver giudicato la mia choco girl. Finally the Slovenya Championship was approved. 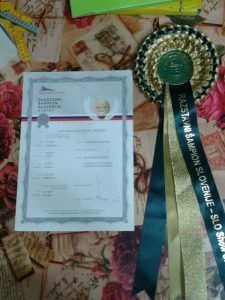 I thank all the judges for having Judged my Choco Girl Satu yla Mononen, Alenka Pokorn,Jože Markelj, Mateja Tomašič e Maja Special thanks to breeder Svetlana Manushko for giving me this Wonderful dog Night Single Nice Surprise ( Barbie).